The weather looked set to change sooner rather than later, so I decided to take a walk before it did. So under darkening skies I turned my nose towards the well trod path up to Peer’s Cave. 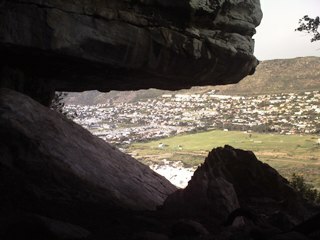 Now, I can see Peer’s Cave from my house, which was a taunt for the first few years that I lived here. Why? Simple, I couldn’t find the path up! I can see tracks in the sand dunes from the house, but when I tried these I found that they led me into some very nasty places full of thorns and tic infested long grass. In desperation I once tried to come from the other side, starting at Silvermine, but that went horribly wrong. Then one day, I found the path up by complete accident and now it is one of my favorite quick walks, especially on summer evenings. So I got to thinking, how many other people living in the area don’t know about this seemingly obvious route up to one of the most unusual places around? If you are parking then I suggest that you use the car park at the back of the sports club in Fish Hoek, there is usually a car god there and it is a lot safer than trying to park at the back of the sports field, I have seen windows smashed there! Walk across the fields to the north corner (you can see the cave, just walk towards it) and when you get to the dirt road you will be able to see the Table Mountain National Parks sign. The maps on these signs are pretty bad so don’t try and follow it, but read the advisories underneath it, just so that nobody can tell you “I told you so”. Walk down the path towards the big sand dune, but don’t worry, you aren’t going to have to climb it. About 50m on you will get to a four way crossing, turn left. This path meanders along for a while, heading towards Sun Valley: you need to be aware though because after a few hundred meters you are going to take a right hand fork off into the dunes. It is pretty easy to spot the gap in the dunes, it seems that the path is prone to grass growing on it and so can sometime be indistinct but it is there and becomes clearer as you get into the dunes. The path through the dunes also snakes around a bit, and there is a path that forks off towards Sun Valley: stay right and on a general course towards the cave and eventually you get to a sand basin. If it has been raining a lot recently then there will be a small pond there, even if it isn’t there at least you will be able to see evidence of it. The path up to the cave is in the left hand corner of this basin, you should be able to see a set of wooden poles laid down to form a set of steps to help you up the sandy banks. Then it is just a case of following the path up the hill. It is steep in parts and you will find a lot of rock stairs, but they are all stable and as long as you are reasonably fit it shouldn’t be a problem. There are a number of natural stop off points where you can catch your breath, and you have the added excuse of stopping to admire the views: as you climb the views get more and more stunning. You will eventually turn a corner, go between two large boulders and step into the cave. 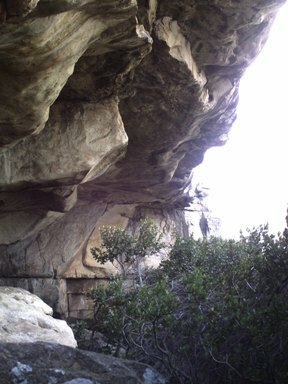 Peer’s Cave fascinates me: it is a place with real presence and you can feel our ancient ancestors look at you as you walk in. The very floor of the cave speaks volumes about its history, the floor is grey from millennia of fires and you will find plenty of shells, hundreds of meters above sea level, many kilometers from the beach. If you turn right and double back around the rock you passed you will find a fantastic vantage point where you can sit and admire the view all the way from Chapman’s Peak right round to False Bay. Just sit and imagine the countless numbers of humans that have say on that very spot and used the view for many different reasons. Imagine what kind of view there would have been of game in the valley floor! After getting as much reward for your efforts as you can it is time to head back down. You basically retrace your steps; please be careful: it’s an easy descent, however it is easy to be seduced by this and rush, making it easier to fall. The descent takes no time at all and pretty soon you will be back down on the valley floor, and I am confident that once you have the Peer’s Cave bug you will be back again and again. When did you last do this walk? Would a small dog be able to manage it? I want to go there but the other walk, from Ou Kaapse Weg, involves rock scrambling for the last section and my dog is too small for that. 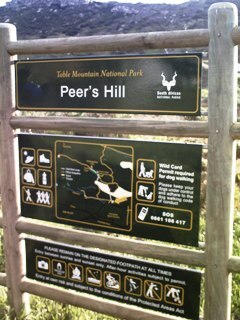 Until I read this I didn’t even know there is another way to get to Peers Cave! I do the walk quite often with two labradors. It is quite steep in places, but there are steps. A very small dog may need help in places, however there are not the places that require you lifting yourself up boulders like from the Ou Kaapse Weg side. One thing that I will say is that it will definately get you breathing heavier than coming from the car park, and worth the effort. I REALLY want to do this walk; we live in Fish Hoek. However, I’ve heard about the muggings and so now I’m a bit nervous. Are you still walking up there? Do you think it’s safe? Many thanks for putting on a comment. I was up at the cave a couple of weeks ago with my four year old daughter. Personally I have never had any trouble on any walks in the area, though I do know people who have, and I am a model of what NOT to do when out and about in the mountains. I go alone and I carry a fairly good camera, usually on show. And I have spent more than my fair share of time on the mountains. I have passed people who did look a little out of place without incident. No, I do not look like Arnold Schwarzenneger, I have just been lucky I guess. I can’t say to you that it is 100% safe up there, but I wouldn’t ever let something like that stop me from enjoying the great outdoors. 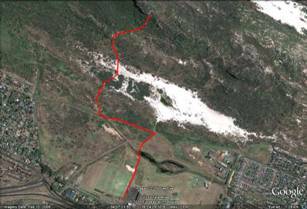 When it comes to Peer’s Cave I think that you are generally safer if you are coming up the slope from the Fish Hoek side, most of the trouble seems to happen at the car park on Ou Kaapse Weg- I guess muggers are lazy. What’s up with the rehabilitation signs and the path being blocked? I haven’t been there since Christmas- which path is blocked? 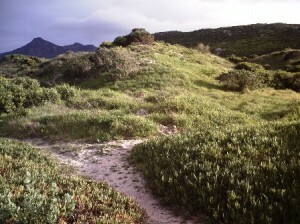 Went up from the Fish Hoek side and all paths were open- the path that runs from the municipal depot to Sun Valley is overgrown just past the main dune access on the Fish Hoek side but other than that it all looks good. If anyone has information about the Ou Kaapse Weg side then please share. I wonder if Hugh has seen the rehabilitation underway just off the playing fields, where the path used to go. There is now a path just to the right of this area that you can use.